Nissan reports that Plug In Adventures has created a specially modified Nissan LEAF for a unique tour. 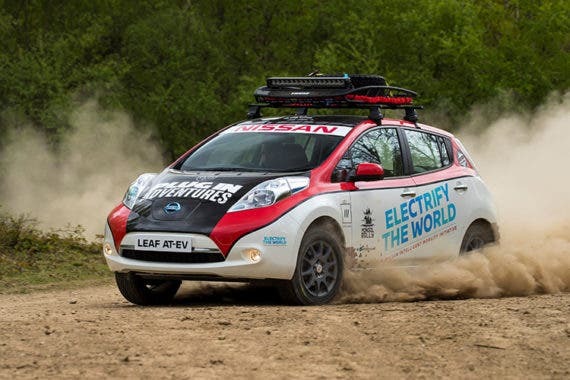 Pioneered with a purpose as the first Nissan LEAF going an immense distance “off the grid,” it will be the first all-electric car to enter the Mongol Rally. That means the special Nissan LEAF — dubbed LEAF AT-EV (All Terrain Electric Vehicle) — plans to drive 10,000 miles (16,000 km) from the UK to Mongolia this summer. “The LEAF AT-EV has been fitted with Speedline SL2 Marmora wheels and Maxsport RB3 narrow tires for better performance on unsealed roads. Welded plates to the underside of the wishbones, braided brake lines, mudflaps and a 6mm aluminum sump guard add further protection from rough terrain. “A modified roof rack provides external storage and is fitted with a Lazer Triple-R 16 LED light bar to produce 16,400 lumens of supplementary low-voltage forward lighting during the remotest parts of the trip. “As the Mongol Rally isn’t a timed race, the entrants’ vehicles ideally provide long distance comfort. The interior modifications to the LEAF AT-EV have been focused on reducing weight and providing more storage space. The driver and front passenger area is unmodified apart from the addition of rubber floor mats. The rear row of seats and rear seatbelts have been completely removed, contributing to a 32kg weight loss. A Fire Extinguisher and Medi Kit have also been integrated into the boot space. It’s a fascinating use of a Nissan LEAF, which is my daily driver in an urban environment. It is perfect for that use, as I’ve detailed for 1½ years here on CleanTechnica, but I’d never think of it as an off-road vehicle. Now I do. That said, none of its talents in this arena surprise me, since I have thoroughly enjoyed its handling, low center of gravity, smooth ride, versatility, and comfort in various environments. Of course, Plug In Adventures put in a lot of work to make it fit for something as extreme as the Mongol Rally. The Nissan LEAF is an ideal choice for this fun charity drive for various reasons, including the fact that it’s the top-selling electric car in history. The LEAF is loved by hundreds of thousands of early adopters across Europe, North America, Japan, and elsewhere. In total, 3 billion kilometers have been logged in Nissan LEAFs, cutting approximately 500 million kilograms of potential CO2 pollution, Gareth Dunsmore, director of Electric Vehicles at Nissan Europe, notes. I can say that I have driven to and through several cities in Southwest Florida in a 2015 Nissan LEAF in the past 1½ years. Even the existing charging network is adequate for regional transport for work and pleasure, and it is getting better by the week. It’s still not quite “convenient” for day trips too far away, but if you plan and have useful things to do while charging, it’s simply a different lifestyle. The long-distance potential of the 30 kWh Nissan LEAF doesn’t surprise me, and I’m happy to see more attention put on it.